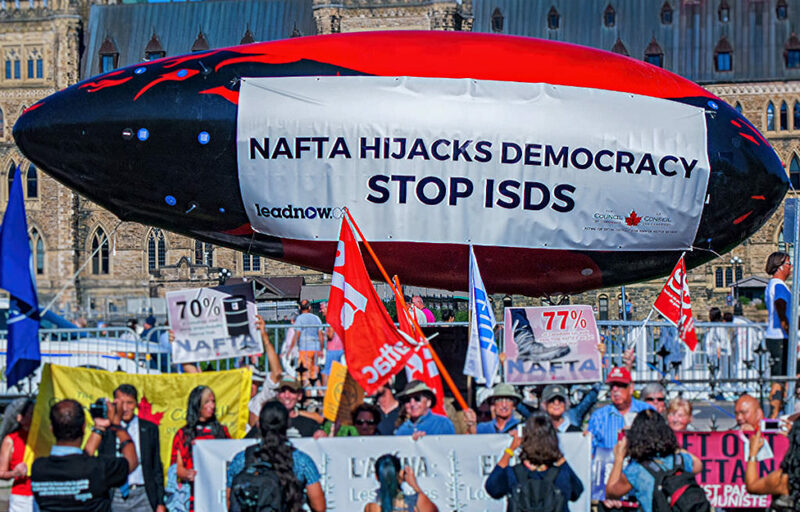 Canadians urged Prime Minister Justin Trudeau to concede on a U.S. demand in Nafta negotiations around investor disputes, while holding firm on calls for more environmental and labor protection. The most frequent advice the government heard in public consultations before North American Free Trade Agreement talks opened in August was to eliminate Chapter 11, the part of the pact that deals with investor-state dispute settlement, according to documents obtained by Bloomberg News through a freedom of information request. The government began the consultation process last year by asking for written submissions from the public after the U.S. gave notice it wanted to renegotiate the 24-year-old agreement. The finding suggests Trudeau has some leeway to soften his defense of the contentious dispute settlement process, which the U.S. wants to make optional, particularly if he can make gains in areas deemed more important to the electorate. The prime minister met with U.S. Vice President Mike Pence in Peru last weekend and signaled willingness to reach some kind of agreement in the next few weeks, even as major obstacles remain over issues such as automobile-content rules. “There is still a legitimate division” over Chapter 11 being in Nafta, said Colin Robertson, a former diplomat and research fellow at the Canadian Global Affairs Institute. “Do we really need this if you have enough other recourse and you have a fair legal system to guard against expropriation?” Chapter 11 was designed to ensure foreign investors are treated fairly in cases such as expropriation of assets, and offers a way to settle disputes through negotiation or arbitration. Internet freedom advocates OpenMedia and 10 other lobbying groups said last week Canada should publish all 46,400 submissions before an agreement is reached. That will show if “the government is listening and planning to act on the consultation results, rather than merely using the consultation as a public relations exercise,” OpenMedia campaigner Marie Aspiazu said in a statement. “Our negotiators engage regularly with an eye to ensuring that our priorities reflect those of the workers and industries that benefit from Nafta,” Adam Austen, a spokesman for Freeland, said Monday by email. Some 20 submissions called for dispute settlement clauses to be kept or strengthened. Most of these named Chapter 19, which covers anti-dumping and countervailing duty disputes. Canada has battled the U.S. in recent years over softwood lumber, metals and dairy products. The U.S. wants to make Chapter 11 optional. Some of Trudeau’s other progressive ideas for Nafta aren’t very popular. While 29 submissions wanted environmental protection and another 21 sought better labor rules, there was far less support for Trudeau’s call for chapters on gender and indigenous rights. Priorities expressed during the consultations also included modernizing Nafta for the digital age, boosting labor and environment protections, cutting red tape and ensuring a free market in government procurement, according to the 1,400 pages of documents, which also showed support for adding restrictions, such as tougher rules against exports of water and energy and to bar tobacco companies from suing governments.